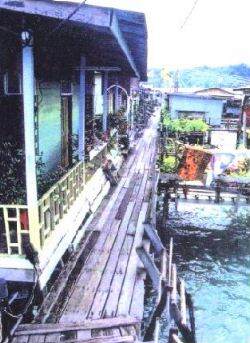 Kampong Ayer, the largest water village in the world, is home to some 30,000 Bruneians. The water village is situated along the banks of the Sungai Brunei, adjacent to the Country’s capital, Bandar Seri Begawan. Following an earlier Master Plan Study by Scott & Furphy in 1986, IEC Sdn Bhd. (formally, CMP-Hamzah) were appointed by the Government of Negara Brunei Darussalam to prepare a pilot vacuum sewerage system for 400 homes in Kampong Ayer. 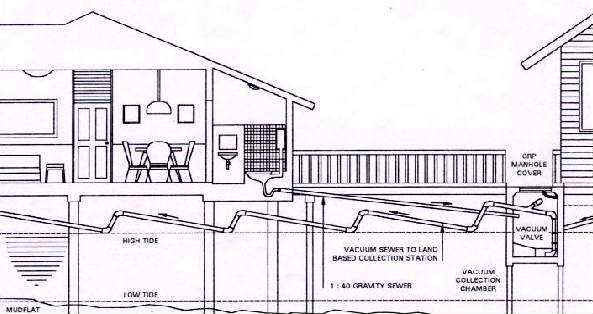 The resultant design employed traditional gravity plumbing from conventional WC’s installed in each home to purpose built vacuum chamber constructed in the shallow waters of the Sungai Brunei. The systems vacuum chambers are then connected by a series of vacuum sewer mains, suspended beneath the walkways, to a land based collection and forwarding station. A social study to determine the local communities needs and acceptance to the proposed sewerage scheme formed an integral part of the project.